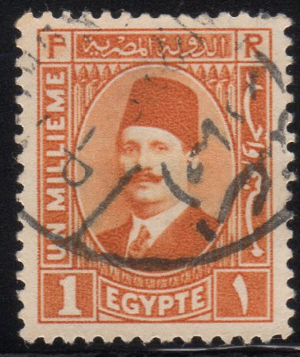 The King Fuad issues of 1927 through 1937 come in a few, usually easy to distinguish varieties. I will focus primarily on the small definitive type but there are a few larger sized stamps that go along with this series as well. 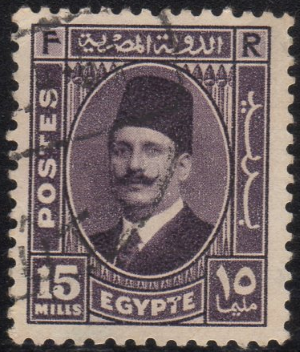 Fuad was first Sultan of Egypt and Sudan in 1917, and then later became King in 1922 when the UK recognized Egyptian Independence. The small definitive stamp comes in 2 basic design varieties. The first was issues between 1927 and 1934, and the 2nd issue from 1936 to 1937. 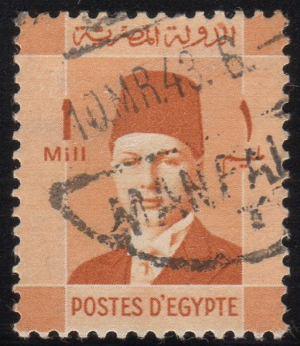 The primary design difference is the inscription on the right side of the stamp. The first version also has 2 printing varieties. 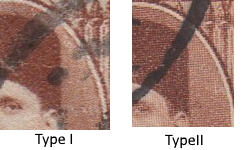 The early printing has a screen of vertical dots in the vignette, and the 2nd printing showing a screen of diagonal dots. There are also various color varieties with minor numbers noted in both Scott and Michel catalogs. 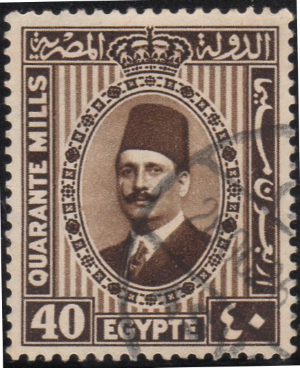 There was a larger version of this definitive issued from 1927 – 1932 featuring a different design.